Rajmahal's unique range of Stitch ezi frames are uniquely hands-free, fully rotating, fully collapsible embroidery lap/table frames. Rings can be set to any angle of work. Fully rotational for easy commencement and finishing off. Rotating tension is adjustable. Arms are adjustable so your work can be set at any angle for maximum ease and comfort. Easy clean surface. Gentle nodules hold fabric firmly. Lightweight, collapsible for transport. Ideal for most needlework applications, including embroidery, crewel, ribbon, wool, cross stitch, goldwork, shisha work, candlewicking, silk ribbon and more. 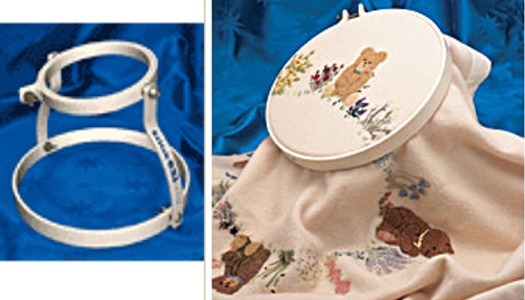 Need an extra hand when using your embroidery hoop? The Stitch ezi frame is a uniquely hands-free, fully rotating, fully collapsible embroidery lap frame. The Stitch ezi Frame is made of recyclable plastic components the plastic being strong, flexible and lightweight, thus making it unbreakable with normal use. The frame is designed for the lap or table. Click the button below to add the StitchEzi Frame to your wish list.